Most of us think about computers as a means to get information. We use computers, smartphones and tablets to perform various business and personal functions. What we might not think about is all the devices that communicate with one another without human involvement. Machine to machine communications, known as M2M, continue to emerge. Have you thought about these technology uses? Your car pairs with your smartphone for music, navigation and phone calls; your tablet can change the channel on your TV; and a smartphone can operate your garage door opener, even alerting you when the door is open too long. Now have you thought about these? What if the lights in your office could detect a change in your body temperature? Many of the McDonald’s locations in London and Rome allow customers to order from digital kiosks. What if the kiosk and ad board changed based on your preferences, which it already knew? What if your new self-driving car knew where to take you because it read it from your electronic calendar? Even more, what if it reminded you that the grocery store and gas station are on the way and that gas is 3 cents a gallong cheaper at Kroger, where you are close to the next level of fuel rewards. The interconnectivity of all these technologies and the information it provides is due to M2M communications, which is growing as fast as any technology segment today. These machines collect and share massive amounts of data, process it, and provide it to us on our mobile devices. Geek trivia: Gartner Group says 8.4 billion connected things will be in use in 2017, up 31 percent from 2016. Home automation is a trending area of M2M communications. Apple, Google, General Electric, Amazon and Microsoft offer products like Homekit, Google Home, Echo and Echo Dot. Other players include Wink Hub, Nest and Belkin WeMo. Many of these “platform” products follow a protocol that pairs it with complimentary products. Some say to decide what you want to automate before deciding on a platform. Are you considering automating your doors, turning lights on and off, managing security cameras or monitoring your heating and cooling? Others claim that the platform is not that important. Why? Your smartphone can control many of these devices through portals and applications. PHOTO BY STEVE BATTIATO Cisco Systems in San Jose, Calif., is the world leader in networking technologies. As part of its corporate social responsibility, the company provides emergency communications services through its TacOps. The free service is available to most areas via a highly portable communications balloon. Since 2005 the TacOps team has deployed to 28 disasters around the world and participated in 16 training exercises around the globe. “Tech Talk” has returned to The Southsider Voice after a lengthy hiatus. Cisco Live 2017 recently commenced in Las Vegas, where 28,000 IT professionals from around the world gathered for the 28th annual event. The program featured keynote speakers from the world’s leader in digital networking – Cisco Systems – other technology leaders and a surprise appearance from Apple CEO Tim Cook. Cisco along with complementary technology companies crowd the world of solutions space, and technical engineers attend certification-based training while networking with one another to discuss challenges and solutions. The event lays a road map for technologies coming to our businesses and homes in the future. This is exciting and scary. 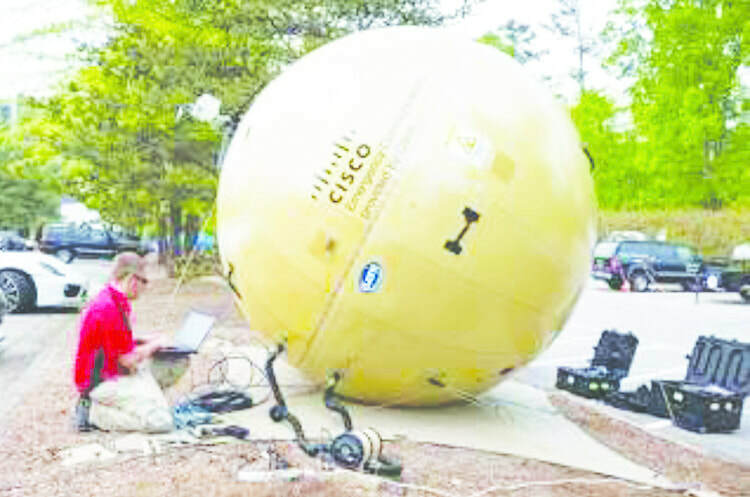 Exciting to see advances in telemedicine, smart buildings and ultra portable communications for emergencies delivered by Cisco’s global emergency response team. Scary because the digital world has many users intent on stealing our identities and our money. Many of the solutions were in the area of IT security. There was a positive vibe in the air, one that you will find at local events hosted by TechPoint and Verge. As much fun as it was to attend Cisco Live in Las Vegas, it is time for Indy to host Cisco Live. Future columns will provide more details about solutions that were showcased. For more information about Cisco Tactical Operations, visit www.southsidervoice.com/techtalk. Geek trivia: According to Global Knowledge, four of the six top paying information technology positions are in security. For more on this story, go to www.southsidervoice.com/tech-talk. In our work and homes we often want to communicate a text message in a larger group or without a phone. You can, for free. You simply need to know the cell phone provider and the recipients ten digit cell phone number. Begin your e-mail message as normal on your phone, tablet, or computer. Address your message to cell phone number@provider. For example, 3175551212@vtext.com. You can address multiple recipients and even use an e-mail group. A list of the most common cell phone providers is included on our website. The recipient will receive the your e-mail message as a text message. As always standard messaging rates apply. E-mail communication continues to be the most consistent platform, however, texting is a more immediate communication method. When you need to get word out that baseball practice is cancelled due to rain or your company meeting is delayed by 30 minutes, then try e-mail to texting. If you are backing up on a floppy disk, iOmega drives, magnetic tape, or even USB sticks, please continue reading. Don’t trust your once in a lifetime vacation pictures or important documents to a USB stick that costs 10 cents to make in a third world country. Our electronic devices hold many important files for our homes and businesses. It is our homework, checkbooks, pictures, movies, and songs. It is also our client list, patient information, legal documents, and contracts. There are many risks including hardware failure, pesky viruses, and environmental issues. Don’t be a victim of lost files. Make certain that all files are backed up. When considering a backup solution there are many considerations. Your solution should be automated. Daily backups are best, hourly are impressive. Backups that store files away, especially offsite from the original computer, are recommended. Should you have a local environmental issue such as fire, water, or smoke damage, an offsite backup is your only source of protection. Many will purchase a large external hard drive and leave it plugged into the original computer all the time so that backups can be automated. Unfortunately, when there is a local issue, both the computer and hard drive are often unusable leaving you without your data or hardware. Backups should be considered for your computers, tablets, and smartphones. There are many options when considering backups for Windows and MacIntosh computers including Mozy, iBackup, and Carbonite. Galaxy Tablets can be backed up with third party software. iCloud is a free service from Apple can be used to automatically backup Apple iPads, iPods, and iPhones. Other smartphone users may have a variety of options including a SIM card, online via your service provider, or via third-party applications. With all this being said, backups are interesting, but restores are priceless. Take time to research different backup solutions for your technology. Make sure it has the capabilities you want at a price that is reasonable to you. Finally, after investing in a backup solution, make certain that you test your ability to restore files on a regular basis. Geek trivia: World backup day is celebrated March 31st each year. Windows based computers offer several options. It is a tiered approach. Upon purchasing a new computer, often times there is no media (CD or DVD) included. The first step is to CREATE RECOVERY MEDIA. This will take between two and five DVD’s and about one hour of clock time. Place those DVD’s in a safe place. As you purchase applications store those original DVD’s in the same place. If the applications are downloaded, store the proof of purchase documentation in a safe place. It is recommended to save off the application downloads to a DVD as well. In case of a failure you can restore your computer and applications. To protect your data, today’s best solutions are online / hosted solutions. Programs like Mozy, iBackup, and Carbonite. I personally use iBackup and recommend it to my clients. iBackup installs a small client on your computer automatically performing daily backups. iBackup allows for installing clients on multiple computers, Windows, Mac, and Mobile devices, sharing a single account. Keep in mind the initial backup will take a long time, while the nightly backup will take only a few minutes. Mac OS based computers offer a simple backup solution for your entire computer. Apple’s Time Machine is included on all Mac computers. Simply purchase a USB external hard drive larger than the hard drive in your computer. Simply plug in the drive and open the Time Machine application. It is recommended that you backup to Time Machine every two weeks or when you have made significant changes to the computer. Time Machine backups up the entire hard drive, including your applications and your data. You may eject the drive and store it away until the next backup. An online / hosted solution is still recommend as it will backup your most important, most recent files automatically each day. In addition, it will get your pictures and files in a different location in case of a catastrophic issue. Once again, I recommend iBackup. Android based tablets and Smartphones require more research. There are a few “free” applications, G Cloud Backup and App Backup & Restore, but be careful. These deliver a small amount of space, then charge to expand the space. My Backup Pro and Titanium Media Sync are paid solutions. Be sure to read the details as each unique program offers different features. Apple based tablets and Smartphones are much easier. Setup a free iCloud account with Apple. Let Apple do the rest. The two things to remember. First, use a tiered approach: 1) how will I restore my original system, 2) how will I restore my purchases (Microsoft Office, Angry Birds, a Northern Nights song, or Frozen the movie), 3) how will I restore my documents, pictures, and other important information? Secondly, backups are interesting, but restores are priceless. Send us an email letting us know if you signed up for iBackup, and we will donate our iBackup product commission generated from this article to your favorite "FREE" community newspaper, The Southsider Voice. Owner and Chief Technologist of IndyTeleData, Steve is a life-long technology guru.